Delivered in true LipService style, MR DARCY LOSES THE PLOT takes Austen’s most famous novel, PRIDE AND PREJUDICE, and turns it completely on its head. The 85 minute show opens with Austen sat in a study writing her novel and dreaming up the character of the handsome yet proud Mr Darcy. But when a visitor approaches, Austen is forced to leave the room and Mr Darcy is left dangling. Clearly dissatisfied with the creative process, Mr Darcy comes to life on stage and starts to write his own preferred storyline. When Austen returns, she finds the plot has moved on and Mr Darcy is dancing to a rather different tune. Clever, witty and delightfully silly, MR DARCY LOSES THE PLOT is a hilarious pastiche mash-up of plots and characters from the world of women writers. Those who have seen LipService before will know that the strength of their performance lies not only in their daft delivery but also in the wit, intelligence and smart critique of their writing. In MR DARCY LOSES THE PLOT, the character of Mr Darcy is written on stage before your eyes, as he finds himself pulled into the world of Daphne du Maurier’s REBECCA, Beatrix Potter’s PETER RABBIT and Elizabeth Gaskell’s MARY BARTON. Maggie Fox takes on the role of Mr Darcy, seemingly ad libbing his way past Austen’s plans for him by dancing the Berserka (a more extreme sports version of the Mazurka) and wrestling carp. The constant references to his reputation as a “strong outdoor swimmer” and the way in which he dives into the famous Pemberley lake (as seen in the popular 1995 BBC TV adaption of PRIDE AND PREDJUDICE) before re-emerging at Manderley as Max de Winter makes for plenty of laughs. Sue Ryder plays all the other parts, including a harried Jane Austen, Elizabeth Bennet, Charles Bingley, Mr Wickham and a hilarious Mrs De Winter. There is also an unforgettable moment in which Ryder battles with the internet cloud, personified by Maggie Fox as a gate keeping but unreliable all powerful entity. To match the patchwork of literary stories, Alison Heffernan’s set design is simply adorned with hand embroidered tapestry panels and large quilts produced by groups from around the country. There is also good use of interactive multimedia, with the duo mixing live action with on-screen recordings, with an ingenious and well-timed ballroom dancing scene providing the most entertainment. While the crossover of multiple storylines does become rather muddled after a while and the introduction of a sub-plot involving Jemima Puddle-duck and Mr Fox in act two is overplayed for laughs, the recognition of characters creates a warm rapport with the audience and there is enough variety in the humour to tickle the funny bones of literature lovers. 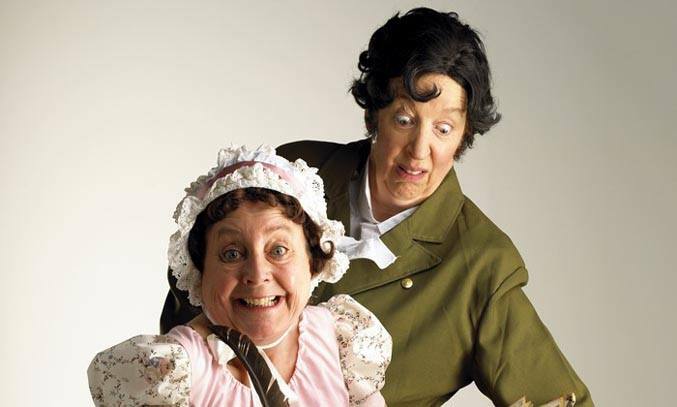 If you’re a fan of LipService’s previous shows THE PICTURE OF DOREEN GRAY, INSPECTOR NORSE, MOVE OVER MORIARTY and WITHERING LOOKS, you’re sure to enjoy MR DARCY LOSES THE PLOT.